We are excited to introduce our Cocos2d-x SDK for AppWarp. Cocos2d-x is a multi-platform port written in C++, originally based on the popular Cocos2d game engine for iPhone. It can be used with iOS, Android, Marmalade and BlackBerry 10. 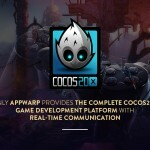 AppWarp SDK will allow Cocos2d-x developers to quickly build real-time multiplayer engaging cross-platform games.